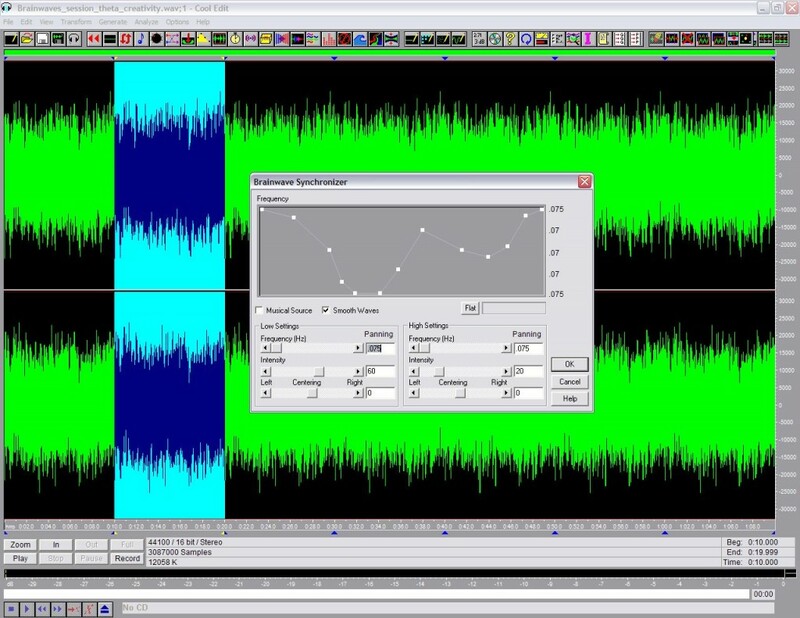 David Johnston, cofounder with Bob Ellison of the company Syntrillium Software Corporation in 1995, is also the creator of the fabulous audio editor Cool Edit 96. He had the idea to integrate into his software a rather original function. In its menus, Cool Edit proposed “Brainwave Synchronizer”… option which makes it possible to obtain the synchronization of an audio file encoded with the cerebral waves. The audio files obtained in Cool Edit function like any recording planned for relieving or the meditation. In the various zones of the brain, the nerve impulse functions in relative coherence and in a rhythmic way: the neurons are activated together (more or less), like a pulsation, then are calmed, then are activated again. Thanks to small electrodes placed on the scalp and connected to a device called electroencephalograph (EEG, invented in 1929), the rhythm of these pulsations can be translated into form waves. Waves delta: from 0.5 to 4 Hz, those of the deep sleep, without dreamed. Loss of the notion of time. Waves theta: from 4 to 8 Hz, those of the major relieving, in full awakening, reached in particular by meditating tested. Waves alpha: from 8 to 13 Hz, those of light relieving and calm awakening. Waves beta: 13 Hz with 35 Hz, those of the current activities. Curiously, the cerebral waves pass to beta for the short periods of sleep with dreamed (paradoxical sleep), as if the activities of dreamed were “current” activities. Waves gamma which would be above 30 or 35 Hz and which would testify to a great cerebral activity, as during the creative processes or of solutions of problems (not to confuse with the gamma rays, emitted by the core of the atoms). The brain is divided into two hemispheres, then in several surfaces, each one having an important function: surfaces of the language, the body sensitivity, the emotion, etc It is known that the hemispheres generally function in a relative independence, and that it left, generally dominating, is the seat of logic and the rational one, while the right is that of the creativity. The frequency of the cerebral waves thus varies according to the type of activity in which one is engaged, but the not trained individuals have relatively little control on those. Too much stress, for example, and the nervous system does not agree to slacken at the time indicated; the cerebral waves then continue to be maintained in the fork beta and it is impossible to find the sleep. One advances that the best mental resources for the creativity and the solution of problems would be in the fork of the waves theta, to which, unfortunately, one does not reach easily. The transport of the cerebral waves requires a carrier wave One can use any sound (voice, music, sounds of nature) for the encoding of the cerebral frequencies which are generated then mixed by the software. According to the author, the most effective means is to use the generator of noise which produces pleasant sounds pointing out the ocean or the releasing noise of a waterfall. The carrier wave must be recorded in stereophony and listening requires a helmet of good quality. The session can be recorded in any portable reader and its listening must last at least 15 minutes. Once installed comfortably, close the eyes and let the magic of the sounds of Cool Edict do the work. You recall, this functions only if you listen to the sounds with a stereo headphone. A noise of helicopter or washing machine will move in your head. These sounds do not come directly from your recording, they are created inside your head. This particular noise will make it possible the cerebral waves to synchronize itself with the models which you recorded. A noise of slowly moving jet from left to right, in background can sometimes be understood by certain people. Another side-effect is that of a wandering spirit. When you use frequencies under 8hz, your spirit is not worried any more by precise thoughts. After 15 minutes of listening or more, you really feel refreshed, luminous, aired. To listen to the binaural beats, it is necessary to be comfortably installed. The stereo headphone is obligatory and the volume of listening should not be too strong (weak to medium). Frequency range : 5 Hz to 10 Hz following the level of relieving wished. Frequency range : 4 HZ to 7 Hz. Frequency range : 4 Hz to 8 Hz during 30 to 45 minutes. Frequency range to begin: 4 HZ to 6 HZ during 30 minutes. Then range of lower frequencies: 3.5 Hz during 30 minutes. Frequency range to sleep: 1.5 Hz to 2.5 Hz. Waves Theta: 4 Hz to 7 Hz during 45 minutes, the every day. Combinations of waves Alpha and Theta. Frequency range 8 Hz to 10 Hz while playing a band of auto–hypnosis or guided meditation. Frequency range of 7 Hz to 9 HZ for any training and to increase comprehension (foreign language, course, texts). Frequency range 5 Hz to 7 Hz during the reading of your subliminal cassettes, or to mix your own recordings of certain assertions in their applying a low volume. Waves Theta during 30 minutes each day. Frequency range : 8 Hz to 10 Hz during 15 minutes. The sounds generated by the function “Brainwave Synchronizer” are not appropriate to the people epileptics or being the object of a psychiatric treatment like the people having heart problems. It is thus advised to them to abtenir itself to use this system.